What Is White Spots On Skin? White Spots On Skin is usually a indication of a loss of pigmentation due to some genetic or environmental causes. 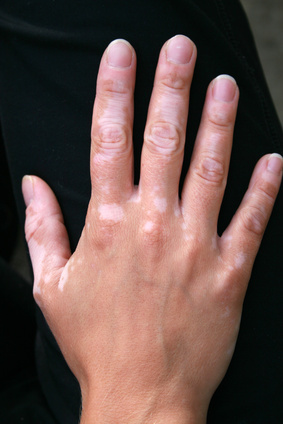 White spots skin discoloration is most likely caused by Vitiligo. This common condition is medically non-contagious or harmful but can cause great distress because it can be quite conspicuous, become extensive, and unattractive. It can appear as spots or patches and occur on any area of the body. Vitiligo affects both, men and women, all skin tones, and all ages. The actual cause of this disorder is still unknown although hereditary factors show an increased risk. It also has been linked to damage from burns or infections, stress, or illness. The good news is that there are many treatments that can slow down or improve the condition. How To Treat White Spots On skin? Cosmetics- You will need to find a product that eliminates the contrast between the normal and de-pigmented tones. To help camouflage white spots apply a good cover-up makeup such as Dermablend or blend in a self-tanner using a brush or Q-tip. Supplements- Nutrients such as B-complex, Vitamin D, Folate, Khellin, and Picrorhiza may help improve symptoms. Herbs- Powerful herbal solutions are available to help such as Ginkgo biloba, Barberry Root, Neem, Termeric, and Babchi. Ginger Treatment- Run a bath with fresh shaved ginger or ginger juice. Ginger is known to improve blood circulation and stimulate skin cells. Red Clay Treatment- The high copper content of red clay can help restore color. Apply a paste of equal amounts of clay with ginger juice to the affected areas. Allow to dry completely and leave on overnight. Wash off. Re-apply daily. Topical Treatment Creams, Ointments, Salves and Gels- The application of medicated solutions can help control symptoms. Some over-the-counter anti-fungal products such as Miconazole, Tinactin or Lotrimincan may be helpful. There are also stronger cortisone creams that are available by prescription. Salicyclic acid, Hydroxyl acid- Acid peel treatments have been successful methods used to encourage skin cell regeneration. Treatments help to resurface the skin, replacing old uneven pigmentation. Phototherapy, Cell transplant, Skin grafting- Physician selected phototherapy UVA or UVB light treatments to stimulate pigmentation cells to produce color again. Cell Transplant-Transplant cells (Melanocytes) from one area to another. Skin Grafting–Surgical procedure to replace the damaged area by re- attaching skin from another part of the body. Oral Pills- Prescription anti fungal pills may be prescribed if the condition is resistant to topical applications. Because white spots on skin can sometimes be due to more serious underlying diseases, consult a dermatologist to diagnose the symptoms and help decide the best treatment plan for you.